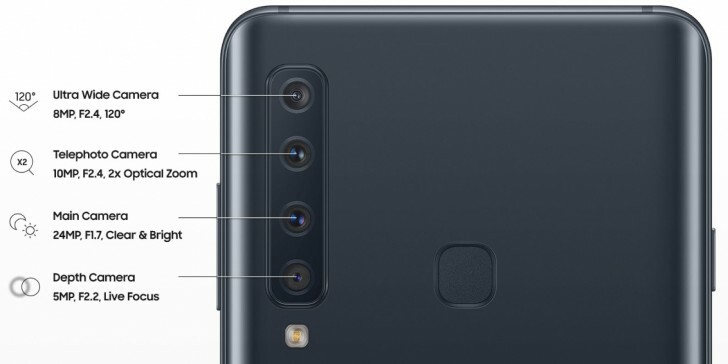 Samsung is introducing the world’s first phone with a quad camera on the back – the Galaxy A9 (2018). 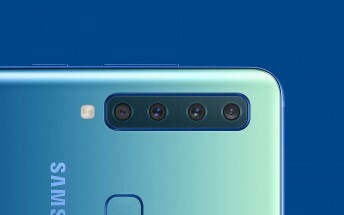 It comes shortly after Samsung’s first triple camera phone, the Galaxy A7 (2018), and builds on it with the addition of a telephoto camera. Between it and the ultra-wide angle camera, you can choose to focus on a detail or capture more of the scene. The tele camera offers 2x optical zoom over the main camera and captures 10MP images. The main camera is a 24MP shooter with a bright f/1.7 lens, suitable for daylight and nighttime shots. The 120° ultra-wide angle camera sports an 8MP sensor. The Intelligent Scene Optimizer is an AI that automatically adjusts the camera settings based on the scene. Finally, there’s a 5MP depth sensor for shots with artificial bokeh. The Galaxy A9 has a large Super AMOLED screen – 6.3” in diagonal. It has 1,080 x 2,220px resolution and is notch free. There’s a 24MP selfie camera (f/2.0) above that screen. This brings the camera count to 5 total. You can store many photos and videos, which to enjoy on the roomy screen. Both versions of the A9 come with 128GB of storage (plus a microSD slot for up to 512GB more), all you have to decide is whether you want 6GB of RAM or 8GB. In either case, you’re getting an octa-core processor (4x 2.2GHz + 4x 1.8GHz), which is running Android 8.0 Oreo with Samsung add-ons. These include Samsung Pay, Health and Bixby. The large screen is great for split-screen multitasking too. The phone comes with a 3,800mAh battery, close to the Galaxy Note9 capacity. The back of the phone features a fingerprint reader. The back itself is made of 3D curved glass for improved ergonomics. 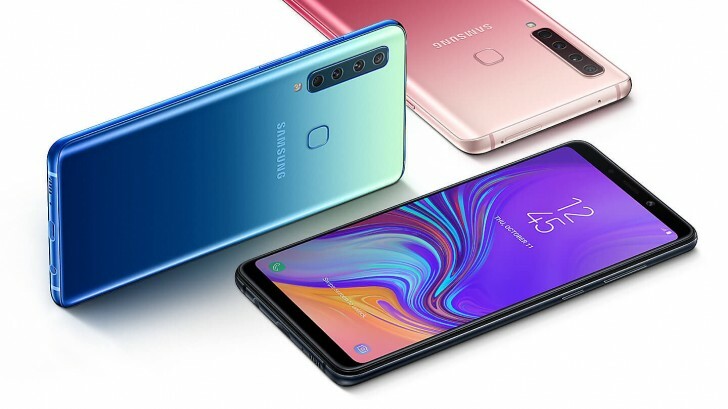 The Samsung Galaxy A9 (2018) will be available in select markets early next month. There will be three colors to choose from: Caviar Black, Lemonade Blue and Bubblegum Pink. Pricing is yet to be detailed.